Casa, 4 dormitorios, 2. 5 baños, capacidad para 12. Eagle's Nest es amplio y luminoso con impresionantes vistas del valle y las montañas. Los pisos de pizarra y los techos altos le darán la bienvenida. Es fácil olvidarse de sus preocupaciones, inclinarse sobre la barandilla de las cinco cubiertas y ver pasar el mundo en el valle más bonito de Montana. Si busca privacidad, nuestros 156 acres están rodeados por terrenos de tres lados. Puede pasear por los lechos de arroyos secos hasta los barrancos y, a veces, ver ciervos y alces.
. También tenemos un único sitio de RV privado en la propiedad con conexiones de agua, eléctricas y sépticas. El sótano tiene un medio baño. 1er piso tiene un medio baño. El segundo piso tiene un baño completo, todo ingeniosamente con azulejos. Suite principal tiene un baño completo - mármol bañera de chorros con ducha independiente. This is a beautiful home with breathtaking views from every room. Our family rented both the main house (Eagle's Nest) and the one-bedroom cottage that is on the property for a family Christmas getaway. We were visiting our oldest grandson, his wife, and their new baby who live in Hamilton, MT. We needed a large home to accommodate our family and this property provided the room we needed. If you are not comfortable with stairs, or dead animals on the wall-this house is not for you. But if you are ok with those couple things, great location to settle into. Drive from main road is 20 min. But view well worth the drive. Just not multiple times a day. Shop first. =) Also on the property- *The Loft sleeps 4-6 and the Cottage sleeps 2; both have been updated, unlike the main house. A garage would have been nice to use at ground level, just for supplies would have been nice. Having to haul everything up and down could have worked out better. Home Owner does pick up garbage daily down at ground level by the garages. I Loved the times I had the whole hill side to myself. So great for my souls growth. I'm glad our client enjoyed our sunsets and views. Unfortunately, she was one of the few who broke our - no pet - policy, though she clearly understood it. Furthermore, Eagle's Nest isn't a 20 min.drive off the highway, it isn't even 4 miles. As far as the wildlife mounts, didn't Roy Rogers have Trigger stuffed? Isn't this Montana? Great house, amazing location, awesome views! We were in the area for a memorial service for a dear family member who had been ill for some time before his passing. The Eagle's Nest was the perfect house for the six of us. Plenty of room, a great kitchen where we could cook and share meals, and the most amazing views in every direction. The Eagle's Nest provided the peace and serenity we needed. Tim and Elaine were easy to deal with, attentive but not intrusive. We hope to be able to return for another visit in the future. Amazing! You will want to return to this exact spot! If you think the views from the Eagle's Nest pictures are beautiful ... they don't compare at all to the real deal! The scenery is both majestic and peaceful. We couldn't get enough and the views are 360 from this location. We stayed over a week and this is the first vacation we've been on where we didn't want to go home when our time was up. Tim and Elaine have picked the perfect spot to appreciate the beauty of the Bitterroot Mountains, Bitterroot Valley and the Sapphire Mountains. They are lovely hardworking people and we enjoyed getting to know them. They will be as present as you want them to be and readily available if you have any questions. The house is huge and inviting with plenty of room for a large family (and also enjoyable for our group of four adults). 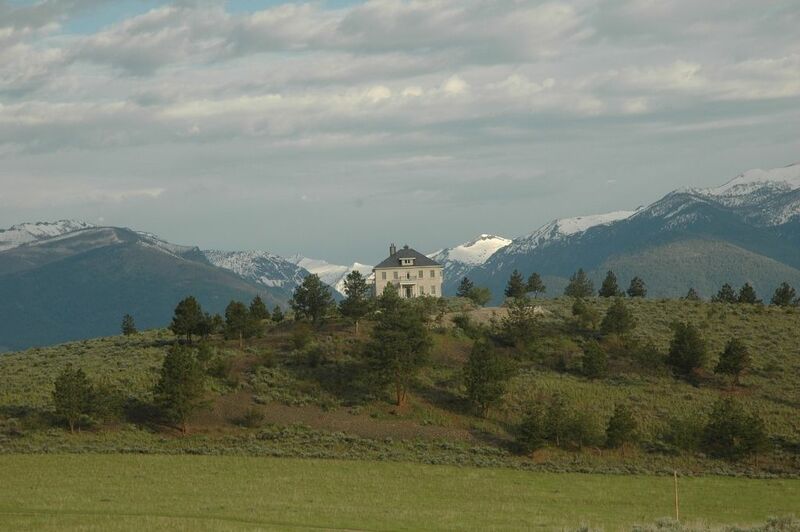 We happily recommend Eagle's Nest for your visit to Montana. Comfortable stay, amazing views, gracious hosts! This location worked out perfectly for some of our family and friends to stay with us before our wedding this summer. It was a comfortable stay in a clean, well decorated environment. If that isn't enough, the views looking out in all directions are awe inspiring. Tim was kind enough to call us in advance to work out the meeting arrangements, gave us a tour of the place and was very pleasant. Staying here helped make a memorable weekend all the more enjoyable! Eagle's Nest está en la cima de una colina y nuestra vista panorámica del Sapphire y Bitterroot Mountains es inigualable. Estamos a 45 minutos en coche del aeropuerto internacional de Missoula. Nuestros 157 acres son muy privados, y se acurrucó en un terreno estatal de 640 acres. Recuéstate y mira pasar el mundo. Garages are closed to vacation home renters though negotiable to monthly renters. Weekly cleaning isn't included for monthly renters.